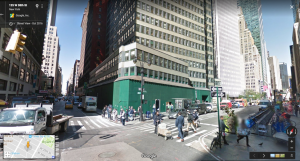 In the morning before work I go to the gym on the corner of 38th street and Broadway. 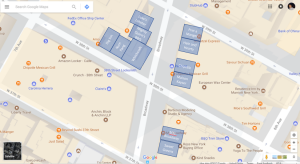 Here’s the intersection (above) – courtesy of Google Street View (at the very left of the picture above, on the second floor, are the windows to the gym). This image is from just over one year ago (October 2016) – you can see directly ahead (on the northwest corner of the intersection) the large green plywood boards covering a construction site. In place of those boards today exist five new quick service restaurants. If you actually go to the Wichcraft website – you will see a picture of this new restaurant as the first image in their carousel. If five new restaurants weren’t already enough, if you turn around and look the other direction, you’ll see six more places to get lunch at this same intersection. Pret a Manger, Hale and Hearty, Chipotle, Maison Kayser, Mr Broadway (Kosher), and Sweet Greens. Eight out of the eleven restaurants on this corner have opened in the last five months. And note – I’ve only highlighted the restaurants at this one intersection. Look closely at the map above and you’ll see ANOTHER chipotle just one block west as well as Moe’s Southwest Grill (effectively the same thing as Chipotle) one block east. Ok – let’s do some napkin math here. I’ll pick on Mighty Quinn’s for a second. Let’s assume that they have about 500 sq feet of real estate and the rent they pay is about $100/sq foot monthly (my rough estimate for their cost is informed by this Quora article – if anyone here knows better, please let me know). That means that Mighty Quinn’s is paying about $50,000/month in rent. Taking a quick look at their menu, I’m going to guess their average sale is around $15.55 – which buys you a ½ lb brisket sandwich and a bottle of root beer. That means Mighty Quinn’s takes home about $9.33 per sale. Based on this math, Mighty Quinn’s first 5,359 customers each month are just paying their rent. Focusing only on the 20 weekdays/month (when folks who work in nearby offices are going to be buying lunch) – this means that Mighty Quinn’s needs to serve 268 people per weekday just to pay their rent. If you think that’s bad – consider the math for Whichcraft. 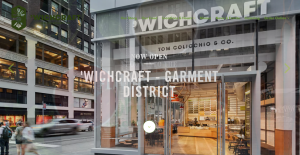 Whichcraft needs to serve 13,888 people per month or 694 people per weekday just to break even on rent. On top of all that – there are now eight new restaurants all competing for the same people! Unless someone here can point to a flaw in my logic, most of these restaurants are going to go out of business. I don’t want to draw any hasty conclusions about the health of the wider economy from just this one intersection, but it is certainly a data point to suggest we’re a little over-extended right now.